Mývatn offers a unique natural environment. 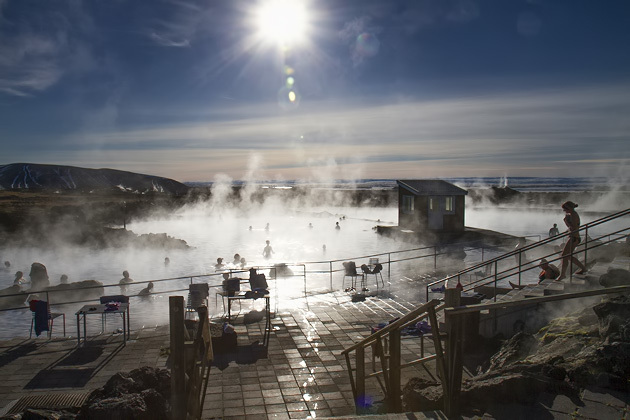 experience the most and the best that Iceland has to offer. Undisputed gem of the northeast, Mývatn (pronounced mee-vaht) lake and the surrounding area are starkly beautiful, an otherworldly terrain of spluttering mudpots, weird lava formations, steaming fumaroles and volcanic craters, set around a bird-filled lake. The Mývatn basin sits squarely on the Mid-Atlantic Ridge and the violent geological character of the area has produced an astonishing landscape unlike anywhere else in the country; this is the Iceland you’ve always imagined. A lake located in the northeast coast of Iceland. It´s the fourth biggest lake in the island and is known for it´s spectucaler birdlife (more duck species then anywhere else in the world) and nature beauty. The name Mývatn means Midgelake and during summertime there can be alot of flies there. There are about 40 small islands in the lake. Askja is one of Iceland´s most famous volcanoes. The word “Askja” in Icelandic means caldera. The Holuhraun eruption site in close to Askja and can be visited although it is not allowed to go closer then 20 meters to the lavafield for safety reasons. The Apollo mission astronauts studied geology in the area before the lunar mission. The crater “Víti” at Askja has warm water in it that is usually around 30 degrees celsius and it is popular to bathe in it when visiting the area. Is one of our nature pearls and is located in the Vatnajökulsnational park. The story says that Sleipnir, Óðins horse made Ásbyrgi with his hoff. Ásbyrgi is about 3.5 km in lenght and 1.1 km wide. There you can see cliffs, lake and much more. There are fantastic walking tracks and also a camping ground. Is located in the Norhtcoast of Iceland at the shores of Skjálfandi bay. Population is about 2300 persons. Húsavík is the center in whale watching due to all the different species you can see in the bay. Museums, shops, restaurants and many more things to see and do there. Ask us about the date of the town festival and more special events. Dettifoss, waterfall is the largest waterfall in Iceland, having an average water flow of 193 m3/s. It´s situated on the Jökulsá á Fjöllum river. Is one of the most spectacular waterfalls in Iceland. It´s located in Bárðadalur and the water falls from the height of 12 meters over a width of 30 meters. The name Goðafoss (waterfalls of the Norse gods) comes from the year 999 when Þorgeir Ljósvetningagoði (lawspeaker) made Christianity the official religion of Iceland. After turning back from Alþingi, Þorgeir threw his statues of the Norse gods into the waterfall. That story preserved in Ari Þorgilsson´s Íslendingabók. Bárðadalur is in the district of Northcoast of Iceland is located at the beginning of the Sprengisandur highland road. Námaskarð is located in Mývatnssveit. 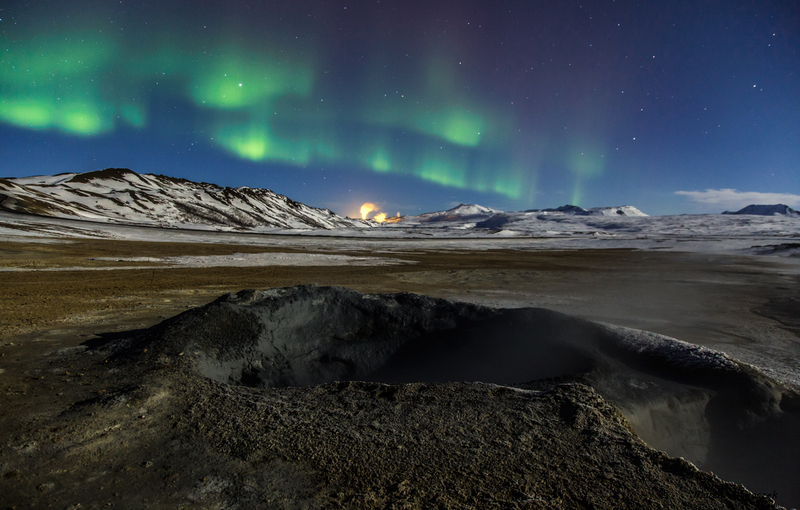 Námaskarð is a myriad of hot mud springs in widely different colours. Nesgjá Kelduhverfi Nesgjá in Kelduhverfi is a beautyful place for divers and for snorkling. With its cristal clear water and underwater view of over 100 meters. You might be able to spot the occasional artic charr while diving in Nesgjá. The Dark Fortress” at Mývatn are a true wonder of nature and nowhere else to be seen in the world, i.e on dry land. 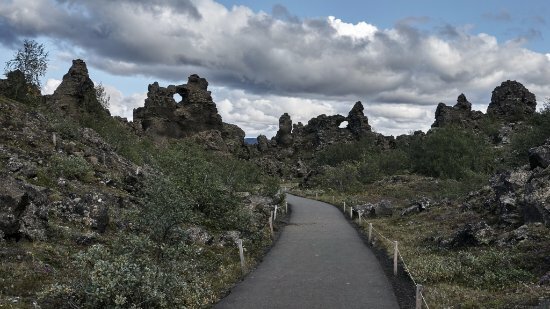 Dimmuborgir consist of are huge lava rock formations which make you feel like you stepped into another world.